Last night, as I was performing my evening ritual of catching up on my favorite blogs, I was stunned and amazed to see one of my absolute favoritest blogs ever blogging about MOI! The backstory on this is that I found the darling Miss Pia by chance, when she was featured on "Blogs of Note" awhile back. I don't always check those out, but I'm so glad I did in this case... I immediately fell in love with her photo essays about life in Sweden, her little "loaf dog", an obsession for the types of shoes I wish I had more of, all things baked and delectable, a penchant for castles and meadows and other assorted bits of loveliness. In short, the one blog I look forward to reading every evening, even if only a picture of the loaf dog sunning in the backyard or a photo of whatever adorable pair of shoes she wore today. A few weeks ago, she had a sweet little giveaway, and somehow or other, my name was pulled. As a little thank you, I sent a few pebbles her way. Well. Gee. Didn't expect such a gorgeous write up about it, but here it is. The World According to Pia- it's a pretty sweet ol' world after all, and it just gets smaller and smaller by the minute. I love that. You are so right about the smallness of this world, particularly the blogosphere. I too found Pia through blogs of note. Which I don't often check. And I too was selected by a delightful bobbaloo to receive a perky mushroom. 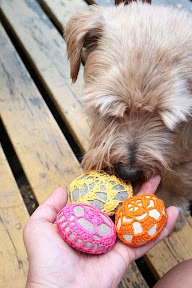 And I loved (big time) your crocheted rock holders. Elephant's Child, I've been reading you, as well. Thank you so much for saying so. You should know that I'm crazy jealous of the amazing birds outside your window! California birds are infinitely less colorful than yours, but I don't hold it against them. Cheers! Love the post and Pia is lovely! She looks happy.